This is a mid century modern tall dresser by American by Martinsville. It has a 5 dovetailed drawers with a streamlined drawer design, tapered legs, and a beautiful wood grain. Dimensions: 40″W x 18.5″D x 46″H. This is a pair of mid century modern 2 tiered side end table nightstands by American by Martinsville. Each table has 1 dovetailed drawer with a curved brass pull, a streamlined 2 tiered design, and tapered legs. This is amid century modern tall dresser armoire by American by Marinsville. The top compartment has 2 doors with sculpted handles that open to reveal 3 top cubbies, and 3 dovetailed drawers. The bottom compartment has 2 dovetailed drawers with sculpted pulls. Dimensions: 40″W x 18.5″D x 61″H. This is a mid century modern desk by American by Martinsville. It has their signature aluminum inlaid design, asymmetrical brass drawer design on 2 dovetailed drawers, a tapered folding extension leaf, and tapered legs. Dimensions: 44″W x 23″D x 29.5″H, 58″ with leaf extended. 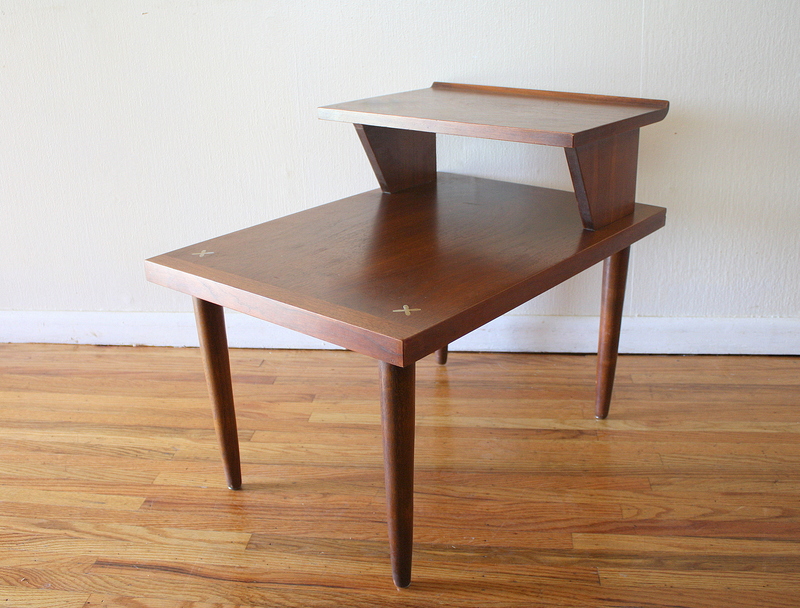 This is a mid century modern square coffee table and 2 tiered side end table by American by Martinsville. Both tables have their signature aluminum inlays and tapered legs, the 2 tiered table has a back surfboard edge. 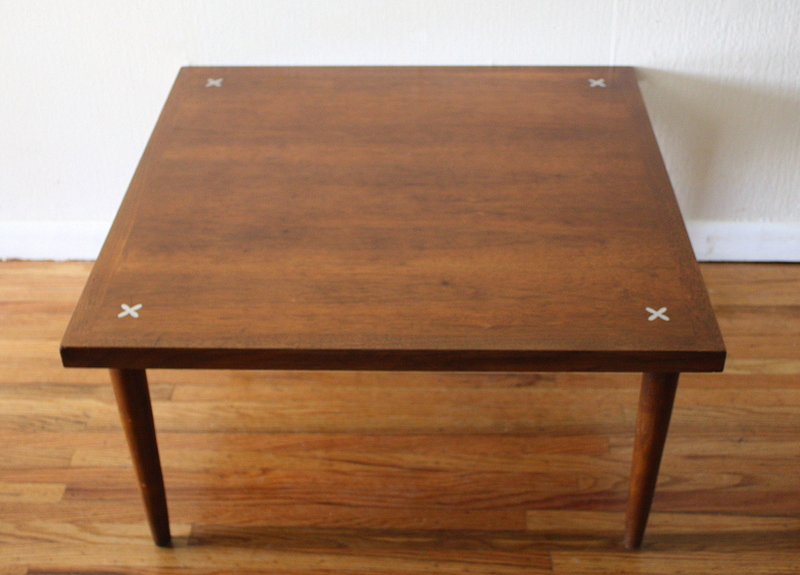 Square coffee table: 31″W x 31″D x 14″H. 2 tiered side end table: 20″W x 24″D x 25″H upper tier x 16″H lower tier. This is a mid century modern gentleman’s dresser armoire by American by Martinsville. It has gorgeous lines and accents: asymmetrical brass pulls on 6 dovetailed drawers, an optional pull out valet tray, sculpted base, and gorgeous wood grain. Dimensions: 49″W x 21″D x 51″ H.
These are 3 mid century modern side end table nightstands with unique styles. The first table is by American by Martinsville and has a slanted design with a sculpted base. The front flips open to reveal a storage compartment, and it has a small accessory drawer: 22″W x 17″D x 25″H. The second table has a cool splayed base, 1 dovetailed drawer with a curved handle, and a bottom shelf, 20″W x 18″D x 24″H. The third table is made by Rway, has 2 dovetailed drawers with brass drawer pulls, a bottom shelf and tapered brass tipped legs:22″W x 15″D x 27″H. Please check captions for prices and availability. This is a mid century modern mini dresser by American by Martinsville. It has the signature aluminum inlays and asymmetrical drawer pulls. 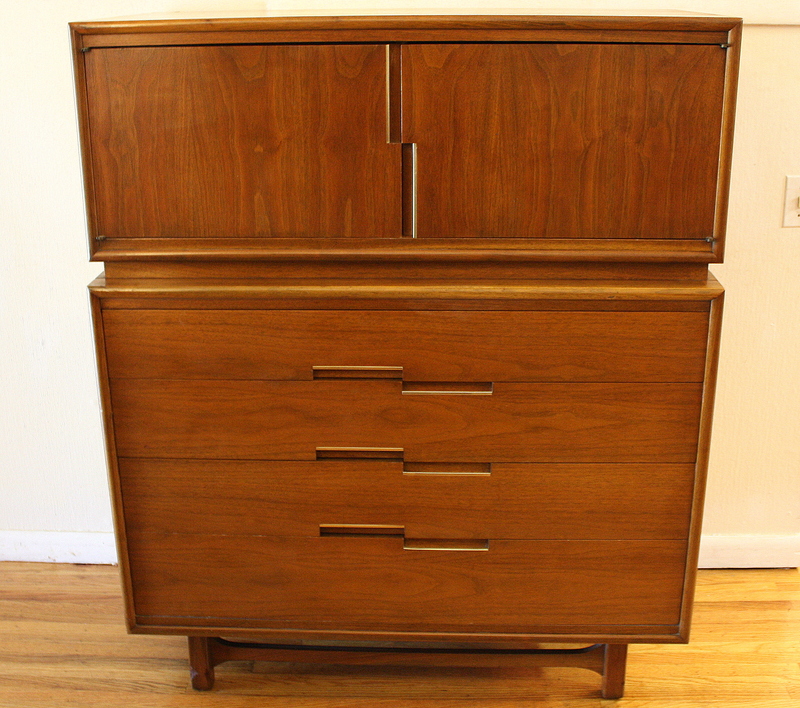 This is a mid century modern credenza low dresser from American by Martinsville . It has a great sculpted design with 6 streamlined dovetailed drawers. Dimensions: 58″W x 19″D x 31″H. This is a mid century modern dining set from American by Martinsville. The table is made of solid walnut, beautiful aluminum “star” insets and contrasting walnut inlays. It also has the signature mcm round tapered legs. The 6 matching dining chairs have a wonderful mid century modern design, beautiful caning in the back and have been reupholstered with new fabric. There are two arm chairs and 4 side chairs. There are 3 extension leaves adding a foot per leaf. 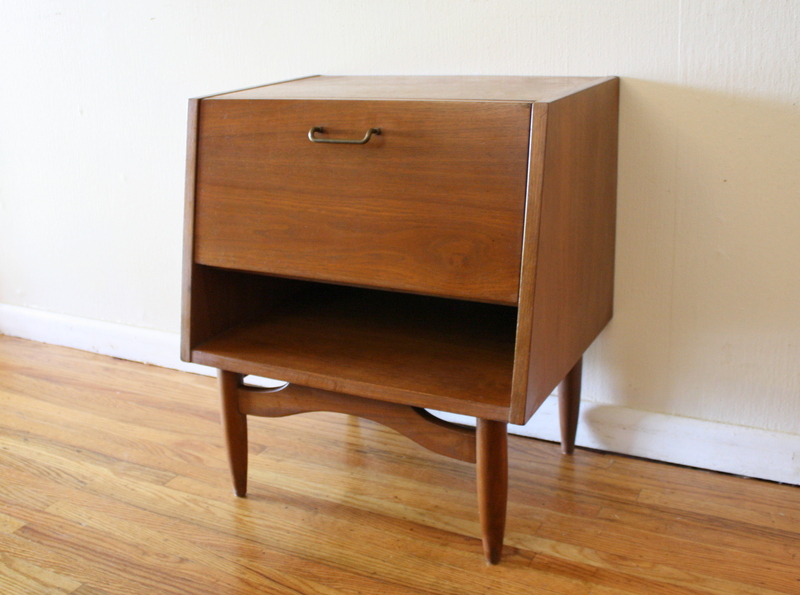 This is a mid century modern side end table from American by Martinsville. It is made of solid wood, has two doors, a dovetailed drawer and a bottom shelf. Gorgeous design, fantastic utility. This is a Mid Century Modern side end table by American of Martinsville. It is in great condition, made of solid wood and a rich warm color. 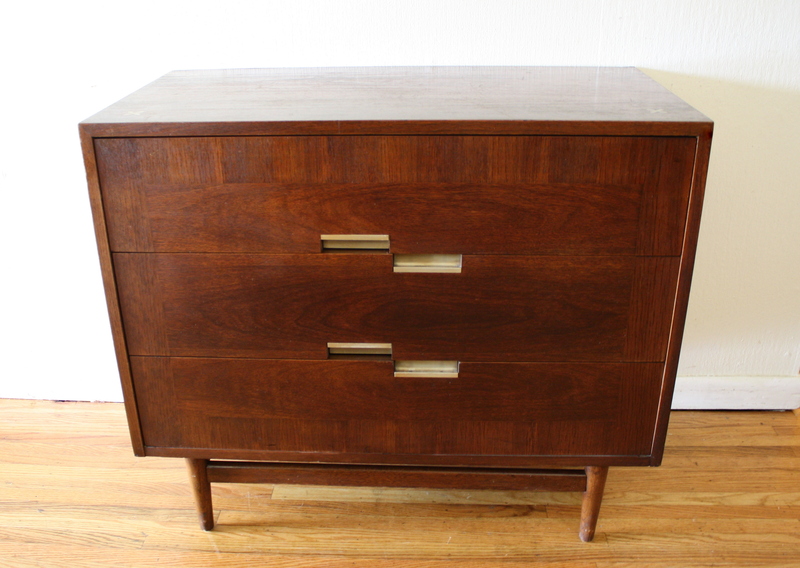 It has one dovetailed drawer that pulls out easily and the signature mid century modern tapered legs.